A fighting game where you don’t fight, a dice game where you don’t roll dice. Kumo Hogasha is an excellent abstract game that you really should try out. Abstract games are games where there is a very thin theme or no theme. The classics of the genre are Chess and Go. They are often games with deep strategies and through that, high replayability. These days many modern abstract games have focused on a lower entry – a simple ruleset that allow for faster learning of the game and the initial strategy, while still allowing for some or most of the depth of the traditional abstracts. Notable of these newer abstract games are the Gipf series of games and especially the immensely popular Hive. Kumo Hogasha (or just Kumo), that just released, is a new game in this tradition. Kumo is a two player abstract game. 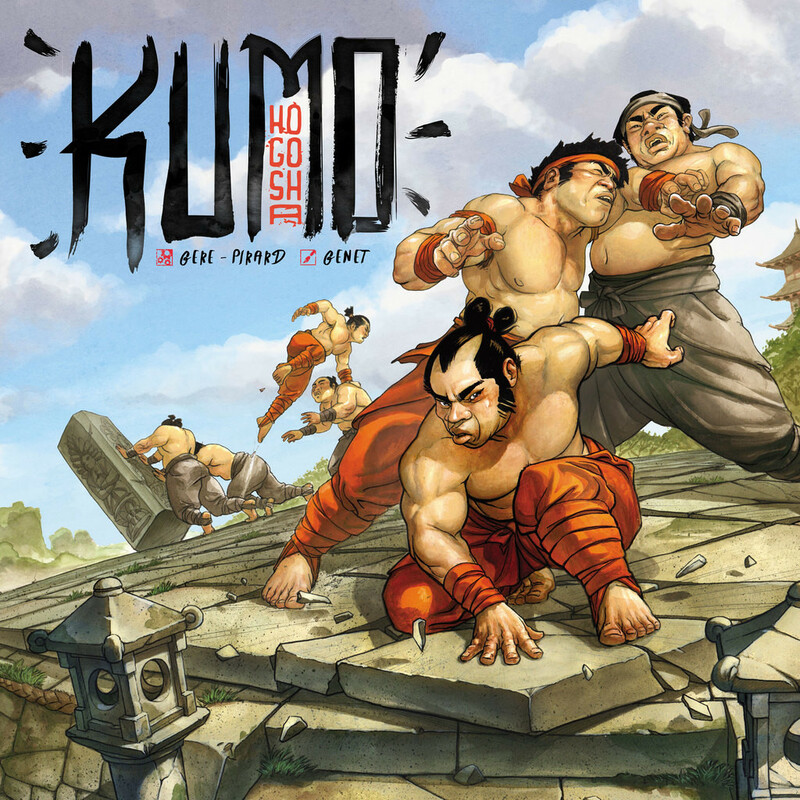 In Kumo you take turns doing five actions: Placing your Kumo dice, moving a Kumo dice, rotating the game board, changing the face of the Kumo dice and taking the action on the face of the Kumo dice. In the middle of the board there is a pylon that each player will try to push over the side of the board at their opponent’s side. But since the board is always rotating, this side will change, and the rotating of the board is a big part of the game. The only way to change the face of the dice are to take the change side action and thus managing the faces of the dice and their position is essential parts of the strategy. Each side of the dice has a different action associated with them. One side is moving two spaces instead of one, another is pushing another die, another is throwing a die and perhaps the most important one is the one to move the Pylon. This action is special in that you can’t move the Kumo when it is selected except to move the pylon which takes two Kumo dice with the move the pylon action selected, standing next to each other and the pylon. Of the games I have played of the game, they have all developed quite differently. You always feel like you can improve your strategy and therefore want to take another shot at the game. I really like this game. If I were a bigger abstract gamer this rating would be even higher. It is a deep but easy to understand game with many layers and possible strategies. There is a team variant where you can play four people two against two, and down the line, the company behind will release more teams the will have dice with different move sets. These sort of games are not for everyone and this one can drag a bit to the long side sometimes for my taste. But this could also just be because I am still new to the game. If you are into abstract games and want a new one that plays in 30-45 minutes, you will definitely find many hours of fun in this game. This is an abstract game, so the theme is barely existing. But when you play these kinds of games you don’t play them for the theme, so that is hardly a knock against the game. 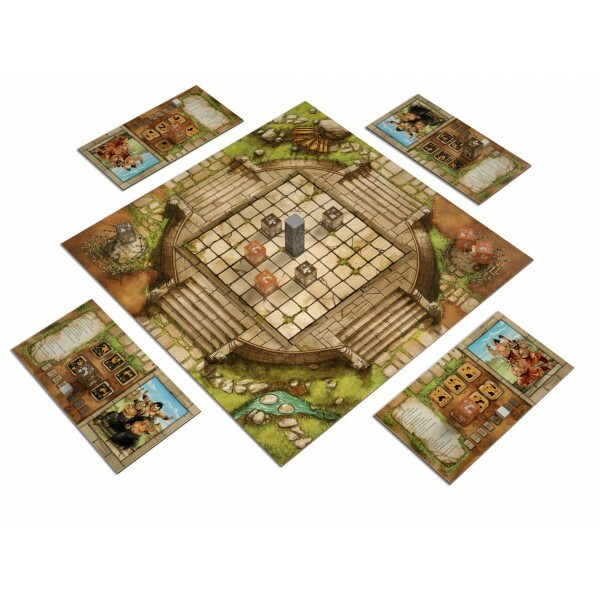 This game is a feast for the eyes, The illustrations are vivid and colourful and even though this is ‘just’ an abstract game, you really have something spectacular in front of you when set up and start a game. Everything about this game screams high quality. The components of the game are incredible, the dice have a nice heft to them and the pylon feels like stone. Even the box is a great experience opening with a magnetic lid. The only small knock is that the rules are divided in to two booklets, one for the core rules and one for the moves for the Kumos. I know why they did this, because they want to add other teams to the game, but as it stands it is slightly less user friendly than it could have been.